There will be a special free webinar on Thursday, January 9, 2014 at 4 PM to highlight the competition. It will also include a special guest appearance from last year’s winners. Learn about their project and get some great tips involving online collaboration for your students. 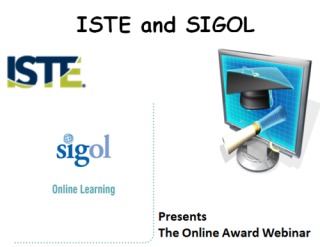 This webinar will also be archived and available on the ISTE SIGOL Site. Consider attending and learning how you can be part of a great program and also be a part of SIGOL at ISTE! You can also learn more about how to enter the competition for the award at SIGOL Online Learning Award.